April 2009… What a Month! 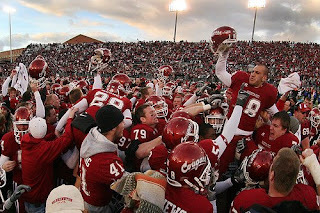 Good morning Coug Nation. Longball here, and it’s time for me to check in. The month began with the news that Tony Bennett was leaving us… for Virginia. Huh? Really? I was absolutely floored. It HAD to be an April Fool’s joke and I read the now infamous 5 pillars over and over to reassure myself that it was just not possible. As it turned out the 5 pillars were a total load of bull and our handsome prince rode off to a much richer kingdom. My family and friends witnessed what can only be described as a full on emotional breakdown by yours truly. Why the breakdown? A little background; One of the most scarring moments of my youth was the departure of Kelvin Sampson, who took the high flying sophomore-to-be Nate Erdmann and super recruit Ernie Abercrombie to Oklahoma with him. It was devastating, and the beginning of our descent into the bottomless pit the Bennett family eventually dug us out of. It would be difficult to exaggerate how close my friends and I were to those Sampson era teams. We were in the first few rows for EVERY game. We played pickup games with the Coug players up at the gyms (this was before the new Rec Center). In our high school AV class we made “I Want to be Like Ike” t-shirts for Ike Fontaine and wore them to every game. We were practically married to cougar hoops. I can’t say for sure if any of us cried when Sampson left, but I also can’t say that we didn’t. Fast forward to April, 2009… As the Bennett news broke I waited for the cascade of bad news that would surely follow. Players would transfer, recruits would de-commit, we would hire some nobody from nowhere… I knew the drill. But something entirely different happened. It turned out our AD had a strong connection to the wiz who had been surprising everybody at Portland State the last 2 years. Ken Bone came on board and from that point on it has been all good news. Not only did we keep all our critical recruits, we added a stand out point guard who was being recruited by, wait for it… Oregon, UCLA and MEMPHIS!! We also retained an assistant, Ben Johnson, whose leadership has been one of the cornerstones of our recent success. By all measures our hoops program is actually in better shape today than it was on April 1. Amazing. While it remains to be seen what a team composed almost entirely of freshmen and sophomores can do in the PAC-10 next year, all indications point to an upward trajectory for Coug hoops in the coming years. On the gridiron we are still deep in the midst of a major rebuilding effort. Literally every level of our program is being rebuilt, from the culture in the locker room, to the bodies on the field, and of course the field itself as we scratch and claw our way towards the remaining two phases of the stadium upgrade in the middle of a global economic meltdown. As our boys were grinding their way through Spring camp we were blind sided by news that the Apple Cup, or as some know it “the only game that really matters”, was going to be moved to Seattle full time. Like most of you I received this news with a combination of dizziness, nausea and that strange discomforting sensation that shoots up your spine and is distributed to all your organs like a million white hot pokers when you get kicked in the balls. Then, I read about why we were doing this. We were poor. Poor like the stories our grandparents tell us about walking 15 miles to school in a blizzard with burlap sacks for shoes and a baked potato in their pocket to keep their hands warm and then eat for lunch. 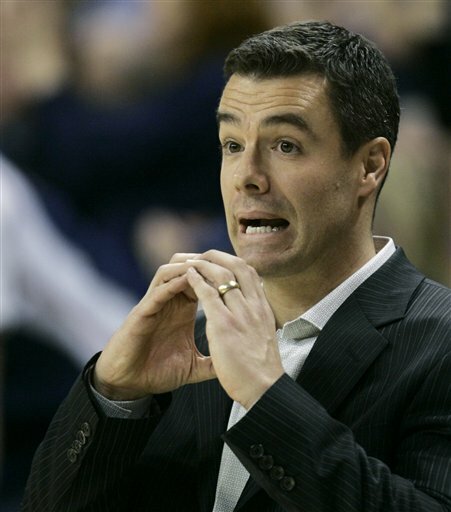 If the PAC-10 was an elementary school classroom we would be THAT kid. You know the one… sitting in the back, with hand-me-down everything, dirt on his face, trying to cheat off Stanford’s test. Just like “That Kid”, we seemed destined for expulsion. In light of this realization, my shock and dismay over the decision to move the Apple Cup to Quest suddenly turned to relief. I was thrilled that we found such an easy revenue stream to help pay the bills so we could come through these trying times unscathed. Moreover, while the Cougar nation whaled in righteous indignation at the perceived slight of playing the game in Seattle, I marveled at our good fortune that the Huskies had agreed to a deal which clearly benefited us WAY more than them. Of course, the Dawgs soon realized this themselves, and in a last ditch attempt to get a deal that didn’t totally screw their season ticket holders blind, they effectively torpedoed the whole thing by asking for a 60/40 ticket split (and rumored to be even more, such as 80/20). Sterk chose to not be lynched by the crimson mob and wisely backed away from the table. So where does that leave us? Off the field, we are still dirt poor and any future phases of our stadium upgrade are a pipe dream until we get some serious support from the very loud, but equally miserly Cougar faithful. As we have had clearly explained to us now by Mr. Sterk, continuing to play in a high school stadium does not bode well for our long term hopes of remaining in the PAC-10. So there you have it Cougs. 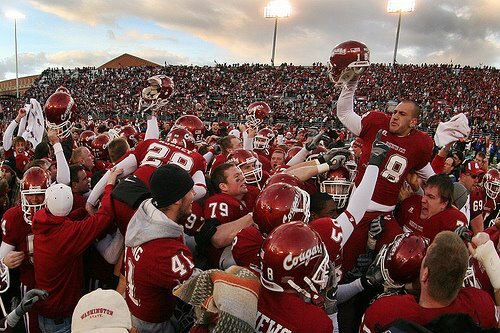 The Apple Cup is back in Pullman, it just may be an out-of-conference game some day. Meanwhile, on the field we have at least one more PAC-10 season ahead of us. So far I am very encouraged by the culture change taking place on and off the field. However this is a team that still fails the eye test. While we are making great strides in the weight room we still do not look like a PAC-10 team, especially on the lines. For the most part our big guys are fat guys with too few exceptions. If you want to see a PAC-10 body type, check out Joe Eppele. 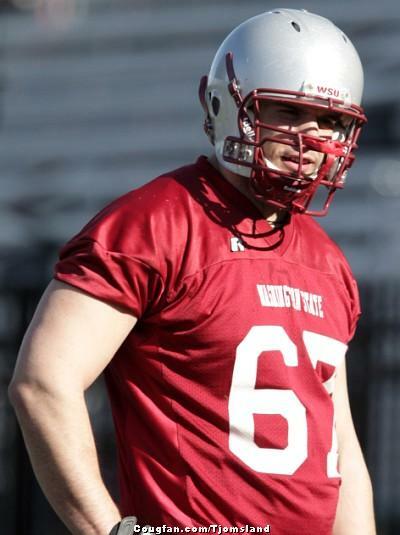 Now THAT is more of what our linemen should look like. I am very excited to see CPW’s first true recruiting class show up for Fall camp. From all indications we will immediately look a lot more like a BCS conference team. One unit we have that most certainly passes the eye test… our running back corps. How on earth did we assemble this posse? While my expectations for the coming season couldn’t quite be described as “modest”, I still look forward to seeing some Cougar football this year that is actually watchable. If Bud Light has drinkability, I predict this year’s Cougars will have watchability. Mark my words. A lot of folks round here seem to have joined the Cougar nation upon their recent matriculation to WSU, so I must inform you that there once was a time when the ONLY sport we Cougs could hang our hat on was baseball. For decades we were a baseball school, in fact. There used to be this strange thing called the PAC-10 North that had Gonzaga and Portland State and I think Cheney High School in it and the Cougs won it every year. We were a pipeline to MLB including Ken Phelps, Aaron Seeley, Scott Hatterburg, John Olerud, Mike Kincaid and even Jim Rome’s childhood hero, Ron Cey. 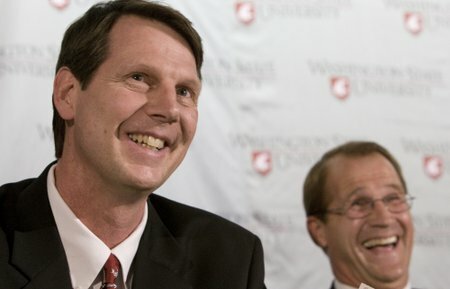 I know, Ron f-ing Cey was a Coug! That’s pretty damn cool. Well it seems the glory has returned to Bailey-Brayton field. Coach Marbut has the Cougs playing great ball and they stand alone in 2nd place in the PAC-10. We are well positioned to make our first post season appearance on the diamond in a very long time and I’m sure Bobo Brayton couldn’t be more proud. But like all news this April, our success on the diamond is a silver lining that comes with its own gray cloud. 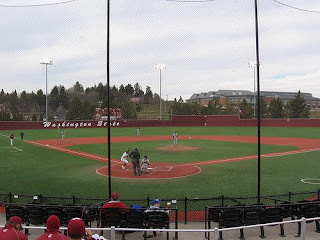 There is a lot of speculation (and thankfully so far it is only speculation) that Baseball is one of the programs on the potential chopping block as WSU athletics looks to make some deep cuts. That would be an unbearable shame. Baseball is one of our few sports that actually has a winning tradition and right now we have a team we can really be proud of. As the season winds down I urge each of you to grab a Ferdinand’s ice cream, head over to Bailey-Brayton and take in a ball game. Bring the kids, its the easiest sporting event to get some quality face time with Butch. 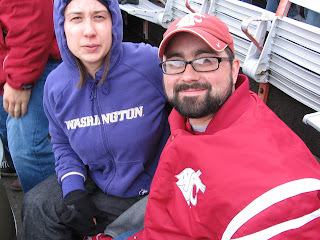 This is Amieable and Longball before the Apple Cup. You gotta hand it to her, she ain’t no bandwagon fan. In a year like the Dawgs just had she put on her purple and braved the hostiles in Martin Stadium, only to get her heart broken. Don’t worry, babe, in the coming years I’m sure you’ll get yours. 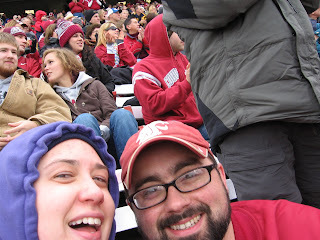 But, in the meantime, and as always… Go Cougs! You are currently browsing the archives for the WSU Cougars Baseball category.